Wow you guys, I have been a HORRIBLE blogger! I apologize for the lack of posting, I've been in a little bit of a rut and honestly, I've been busy being a mom and enjoying my time with my girl. It's amazing how little time I feel like I have in the evenings after I pick her up from daycare, get home, change her, get myself in my comfy clothes, make dinner, straighten the house, take the dog out, do a load of laundry, give her a bath, etc. etc. then it's pretty much time for bed! Even though our routine doesn't change much and our days are pretty ordinary, the time has felt like it's absolutely flying! Georgia is officially 7 months now as of the 22nd. Each month that passes she gets spunkier and funnier, and her personality grows by leaps and bounds. This last month was one of our more challenging months as she is growing like a weed and evolving more every day. She's not my great sleeper that she once was, although she's not terrible either, the last thing the girl wants to do is nap or sleep, she's just afraid she's going to miss something. She's extremely strong now too, she'll stiffen herself and arch her back when I try rocking her to sleep if she's not having it. We battle most days and I know that this sleep routine is definitely not the best for either of us, but it's what I'm choosing to continue to do for now. I think that she is probably ready for her crib, but mama isn't quite ready for her to be in her own room yet. I'm still enjoying room sharing and co-sleeping with her and I'm not ready to give that up quite yet. Georgia has been eating tons of different solids, we typically stick to purees, but she's also eaten French fries, eggs, peaches, banana slices, potatoes and other various types of food and has loved all of them. Not only does she have FOMO during nap time, but when we are eating, she her FOMO generally kicks in if she is not given a piece of whatever it is that we are having. She also continues to nurse like a champ and I've now officially been breastfeeding for 7 months! I bought her a walker for $5 at a garage sale and that has been her new favorite toy. She also loves to roll around and she loves putting her feet in her mouth. Some nights she gargles and blows raspberries for what seems like hours. Sometimes she smiles so much I just think to myself, her cheeks have to be killing her! But we love that she's a little social butterfly and that she is such a happy girl. She also loves her puppy and kitty and when they are near her she has to pet them and stare at them. We are hoping soon she will start crawling but she seriously loves to stand and to walk in her walker so I would not be surprised if crawling is something she only does for a short period of time. At her last doctors appointment mid-September she was about 16lbs 1oz and she was 2'6". At her 6 month check up her head circumference was in the 95th percentile, she's got a large head for sure, which I think means she's going to become a doctor or maybe is some kind of child prodigy. ;-) Right now she's wearing mostly 6 month stuff, or 6-9 month, but some of her footie PJ's are getting to be a little tight on her. She still wears a bow every day and dressing her up in her cute outfits is still one of my favorite things to do. I cannot wait to dress her in some of her fall outfits and for Halloween. Just when I think that she can't get any more amazing, she does something that completely awes me it's truly amazing to watch her develop as a tiny human. We love this stage she is at now and how fun and interactive she is, we know it will only get better. We know our love for her will only get stronger, and she continues to make us smile every day. Happy 7 months GJ! Isn't it crazy how much they develop so quickly?! They just grow so fast. Rory has a big head too. I tried putting a 9 month pj shirt on her the other night and it wouldn't go over her head anymore. I can't believe she is wearing 12 month clothing. Rory also went through a little time period where she was ready for her crib and we tried it out but then days later, she was back to wanting to be in her pack n' play in our room or in our bed when Jesse started night shift back up. So sweet reading his update. She sure is a beauty and I love her smile. 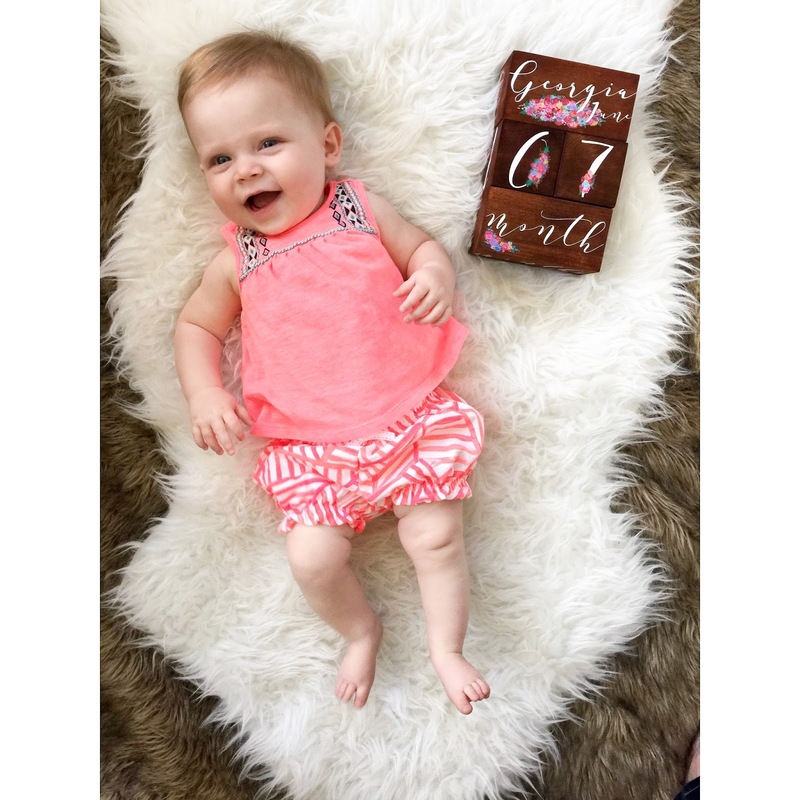 How can this sweet girl be 7 months already?? Unbelievable! Our evenings sound just like yours excepts most of the time I can't even get dinner cooked with a toddler running all over the place! She's so big!!!! Moving my daughter to her own room was HARD! We moved her at 7 months, but my compromise to myself was that I could still take her to bed with me if she woke in the night. ;) Cosleeping saved my sanity. I can't wait to see her Halloween costume! I think nights together is just some of the best time! One thing that has worked for our family is to start the kids in their own bed/crib, but then thwe first time they wake up we bring them into our bed. I like that it gives them the opportunity to sleep uninterrupted, but that we still get those nighttime snuggles and wake up together.